The RTA Air Defence Command displayed their VL-MICA air defense missile system. Photo c/o AAG_TH Thai Defense Page. 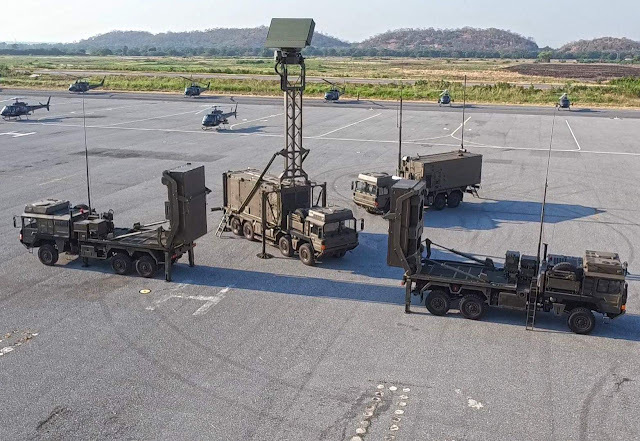 The Royal Thai Army (RTA) Air Defence Command confirmed the delivery of the ground-based version of MBDA’s VL-MICA short to medium-range air defense missile system, which will replace the ageing Selenia (now MBDA) Spada air defense system acquired in 1988. The system was displayed by the RTA during a recent localy event, which includes two self-propelled truck-mounted firing systems, an Airbus Defence and Space TRML-3D/32-6 air defense radar system, self-propelled command and control stations, and other equipment for a small air defense unit. The RTA Air Defence Command confirmed that they received the system in 2018, and is said to cost THB3.52 billion (US$11.08 million) to defend the Bangkok metropolis area. The MBDA VL-MCA has an effective maximum range of 20 kilometers, with each self-propelled firing units having a box missile launcher for 4 ready-to-fire VL MICA RF Active Radar Homing or VL MICA IR Infrared-guided missiles. The RTA plans to acquire more units once budget is available.